Objective: To improve the accuracy and completeness of reporting of studies of diagnostic accuracy, to allow readers to assess the potential for bias in a study, and to evaluate a study's generalisability. Methods: The Standards for Reporting of Diagnostic Accuracy (STARD) steering committee searched the literature to identify publications on the appropriate conduct and reporting of diagnostic studies and extracted potential items into an extensive list. Researchers, editors, and members of professional organisations shortened this list during a two day consensus meeting, with the goal of developing a checklist and a generic flow diagram for studies of diagnostic accuracy. Results: The search for published guidelines about diagnostic research yielded 33 previously published checklists, from which we extracted a list of 75 potential items. At the consensus meeting, participants shortened the list to a 25 item checklist, by using evidence, whenever available. 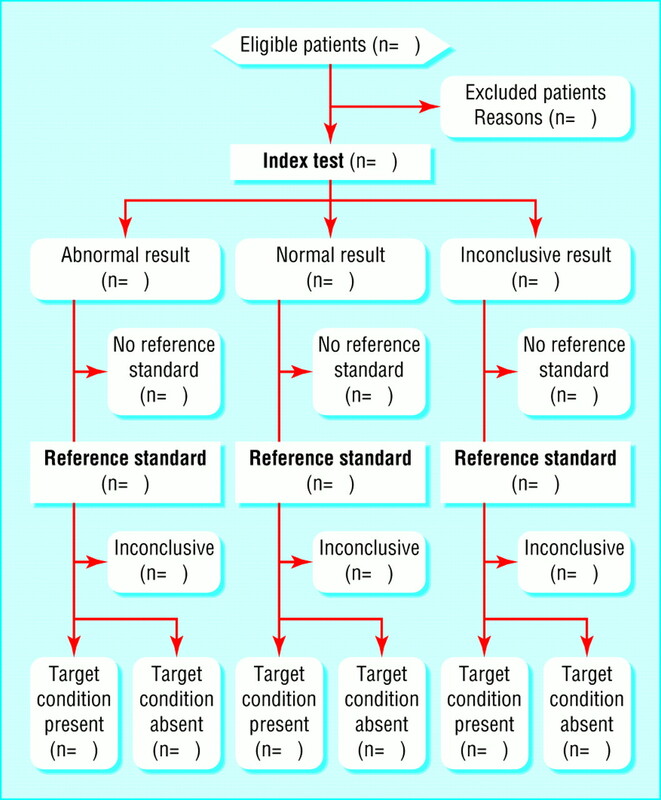 A prototype of a flow diagram provides information about the method of patient recruitment, the order of test execution, and the numbers of patients undergoing the test under evaluation and the reference standard, or both. Conclusions: Evaluation of research depends on complete and accurate reporting. If medical journals adopt the STARD checklist and flow diagram, the quality of reporting of studies of diagnostic accuracy should improve to the advantage of clinicians, researchers, reviewers, journals, and the public. At the 1999 Cochrane colloquium meeting in Rome, the Cochrane diagnostic and screening test methods working group discussed the low methodological quality and substandard reporting of diagnostic test evaluations. The working group felt that the first step towards correcting these problems was to improve the quality of reporting of diagnostic studies. Following the successful CONSORT initiative,11–13 the working group aimed to develop a checklist of items that should be included in the report of a study on diagnostic accuracy. The objective of the Standards for Reporting of Diagnostic Accuracy (STARD) initiative is to improve the quality of reporting of studies of diagnostic accuracy. Complete and accurate reporting allows readers to detect the potential for bias in a study (internal validity) and to assess the generalisability and applicability of results (external validity). The STARD steering committee (see bmj.com) started with an extensive search to identify publications on the conduct and reporting of diagnostic studies. This search included Medline, Embase, BIOSIS, and the methodological database from the Cochrane Collaboration up to July 2000. In addition, the members of the steering committee examined reference lists of retrieved articles, searched personal files, and contacted other experts in the field of diagnostic research. They reviewed all relevant publications and extracted an extended list of potential checklist items. Subsequently, the STARD steering committee convened a two day consensus meeting for invited experts from the following interest groups: researchers, editors, methodologists, and professional organisations. The aim of the conference was to reduce the extended list of potential items, where appropriate, and to discuss the optimal format and phrasing of the checklist. The selection of items to retain was based on evidence whenever possible. The meeting format consisted of a mixture of small group sessions and plenary sessions. Each small group focused on a group of related items in the list. The suggestions of the small groups then were discussed in plenary sessions. Overnight, a first draft of the STARD checklist was assembled on the basis of suggestions from the small group and additional remarks from the plenary sessions. All meeting attendees discussed this version the next day and made additional changes. The members of the STARD group could suggest further changes through a later round of comments by email. Potential users field tested the conference version of the checklist and flow diagram, and additional comments were collected. This version was placed on the CONSORT website, with a call for comments. The STARD steering committee discussed all comments and assembled the final checklist. The search for published guidelines for diagnostic research yielded 33 lists. Based on these published guidelines and on input of steering and STARD group members, the steering committee assembled a list of 75 items. During the consensus meeting on 16–17 September 2000, participants consolidated and eliminated items to form the 25 item checklist. Conference members made major revisions to the phrasing and format of the checklist. The STARD group received valuable comments and remarks during the various stages of evaluation after the conference, which resulted in the version of the STARD checklist in the table. A flow diagram provides information about the method of patient recruitment (for example, enrolment of a consecutive series of patients with specific symptoms or of cases and controls), the order of test execution, and the number of patients undergoing the test under evaluation (index test) and the reference test. The figure shows a prototype flowchart that reflects the most commonly employed design in diagnostic research. Examples that reflect other designs appear on the STARD website (http://www.consort-statement.org/stardstatement.htm). The purpose of the STARD initiative is to improve the quality of reporting of diagnostic studies. The items in the checklist and flowchart can help authors to describe essential elements of the design and conduct of the study, the execution of tests, and the results. We arranged the items under the usual headings of a medical research article, but this is not intended to dictate the order in which they have to appear within an article. Wherever possible, the STARD group based the decision to include an item on evidence linking the item to biased estimates (internal validity) or to variations in measures of diagnostic accuracy (external validity). The evidence varied from narrative articles that explained theoretical principles and papers that presented the results of statistical modelling to empirical evidence derived from diagnostic studies. For several items, the evidence was rather limited. A separate background document explains the meaning and rationale of each item and briefly summarises the type and amount of evidence.15 This background document should enhance the use, understanding, and dissemination of the STARD checklist. The STARD group put considerable effort into the development of a flow diagram for diagnostic studies. A flow diagram has the potential to communicate vital information about the design of a study and the flow of participants in a transparent manner.16 A comparable flow diagram has become an essential element in the CONSORT standards for reporting of randomised trials. 12 16 The flow diagram could be even more essential in diagnostic studies, given the variety of designs employed in diagnostic research. Flow diagrams in the reports of studies of diagnostic accuracy indicate the process of sampling and selecting participants (external validity); the flow of participants in relation to the timing and outcomes of tests; the number of subjects who fail to receive the index test or the reference standard, or both (potential for verification bias17–19); and the number of patients at each stage of the study, which provides the correct denominator for proportions (internal consistency). The STARD group plans to measure the impact of the statement on the quality of published reports on diagnostic accuracy with a before and after evaluation.13 Updates of the STARD initiative's documents will be provided when new evidence on sources of bias or variability becomes available. We welcome any comments, whether on content or form, to improve the current version. This initiative to improve the reporting of studies was supported by a large number of people around the globe who commented on earlier versions. This paper is also being published in the first issues in 2003 of Annals of Internal Medicine, Clinical Chemistry, Journal of Clinical Microbiology, Lancet, and Radiology. Clinical Chemistry is also publishing the background document. Funding Financial support to convene the STARD group was provided in part by the Dutch Health Care Insurance Board, Amstelveen, Netherlands; the International Federation of Clinical Chemistry, Milan, Italy; the Medical Research Council's Health Services Research Collaboration, Bristol; and the Academic Medical Center, Amsterdam, Netherlands.